The boundaries separating traditional models of commerce with their newer, sleeker digital counterparts are growing murkier by the day. Industry segments are quickly blending into one another, where the most successful companies are no longer strictly e-commerce or bricks-and-mortar. Instead, businesses are adopting a much needed hybrid approach to nearly every facet of operations, converging the familiarity and tactile benefits of physical storefronts with the prescient efficiencies of the vast digital environment and the technological innovations it lends. To put a finer point on this convergence, the tremendous innovations already propelling digital messaging can now guide and inform in-store applications as well. The insights gathered from technologies typically associated with digital campaigns can deepen the understanding of in-store retail consumer expectations, behavior, and the intricate components of their decision-making process. Leveraging sophisticated tools like Oculus360’s (O360) own insightful, AI-based platform, a bricks-and-mortar customer’s journey and experience can now be curated and guided with the same precision as the most compelling, engaging, and effective digital messaging. Recently, O360 has collaborated with in-store analytics and marketing platforms for the storefront retail space to generate personalized, in-store marketing that was previously the exclusive domain of digital campaigns. The integrated efforts of O360’s platform and in-depth retail analytics leverage the troves of consumer data culled from the online environment to provide a far more thorough understanding of audience segments. Such an approach engages at an individual level through a highly personalized approach that caters to specific affinities. As time passes and brands continue to grasp and embrace the far-reaching benefits provided by O360 and other digital technologies, both online and in-store, the boundaries separating bricks-and-mortar enterprise and digital business will continue to crumble. The example set forth by O360’s insights and in-store analytics platforms will become commonplace in coming years. In other words, this is just the beginning of digital personalization's reinvention of the retail experience, and the best is yet to come. Sometimes the truest insights lie buried in what are seemingly straightforward statistics. Take the unrelenting march of e-commerce, for instance, where over 80% of American consumers already prefer online shopping – significantly higher than the 46% at the turn of the 21st century. As the saying goes, however, looks can be deceiving, and statistics only tell a portion of the ongoing retail narrative. While it’s certainly true that digital commerce has quickly grown roots that extend to even the farthest reaches of the collective customer base, bricks-and-mortar enterprises have experienced a simultaneous renaissance of sorts in recent years. In 2017, 42% of large, in-store retailers increased their number of storefronts, while only 15% closed locations. As counterintuitive as it might seem at first glance given the extraordinary growth of e-commerce, the retail sector has consistently exhibited robust growth in both revenue and profitability, a mere decade after many analysts proclaimed impending death for the sector at the hands of its own online brethren. Granted, retail department stores continue to struggle as they search for more efficient and effective ways to engage their audience and escape the digital shadows of e-commerce titans. However, harkening back to the original thesis, the isolated failures of large departments stores is a testament to the importance of a tailored approach to a brand’s message which, in recent years, has been an abject failure of many venerable and storied companies. As recent history teaches us, even the biggest of retail brands are susceptible to disinterested customer bases if they fail to understand their consumer segments, meet audience expectations, and continually refine the customer experience. Thankfully, department store struggles have been the exception to the rule as many participants in the retail sector have been far more successful at engaging the audience, despite the ubiquitous presence of online powerhouses. Those that have found enduring success have exhibited the agility needed to flex with a dynamic marketplace and continuously shifting affinities, primarily with a more unified approach that merges storefront strategy with digital innovation. Where department stores have failed, other components of the retail sector have devoted the necessary resources to tools that help them maintain and expand market share with predictive analytics. These tools allow brands to develop models that can accurately predict consumer decision-making, even in the face of innumerable external and internal variables. Once a retailer understands the audience and its purchasing decision process, they can create the personalized interactions and customized experiences that engage and convert. Traditional models that rely on generic, sweeping messages to appeal to the greatest number of consumers no longer create adequate results. Instead, brands must tailor their campaigns to the individual, not the marketplace. The analytics driving this push towards hyper-customization provide insights into the many components of key personas, including everything from location intelligence using GPS data, Wi-Fi triangulation, and beacon technology, to the affinities and psychographics harvested by O360 and the wealth of social influence data in the online environment, particularly in the form of pertinent, revealing customer reviews. Of course, having the data itself is only a single – albeit critical – stage of a personalized approach. Subsequent stages require the ability to act upon that data in real time, giving brands the agility needed to refine their messaging and leverage market trends in the most advantageous way possible. Design and distribute messaging that will form emotional connections between the brand and consumer, fostering and enhancing in-store loyalty that will provide a stable foundation to build from. Although relatively simplistic at first glance, just a handful of straightforward techniques can address relevant questions and reveal the accompanying answers that, together, give a much-needed sense of direction when developing in-store personalization strategies. Engage the customer through emotion rather than mindless repetition or the loudest voice to connect with the individual consumer and not the broader customer base or even audience segment. Obviously, consumer profile data lies at the heart of a personalized in-store experience, one that relies on individual preferences, expectations, and interests to maximize engagement with retail shoppers. O360’s platform is designed to provide those very same data points, sifting through the vast reservoirs of consumer reviews and comments scattered throughout the online environment to interpret nuanced opinion and distill enormous quantities of information into succinct, precise data efficiently transformed into actionable insights. As seen in the graphic, our AI-based consumer insights overcome the inherent inadequacies of the more traditional, overly simplistic analytics platforms that rely on the most basic of affinities and browsing habits to inform a message. Instead, O360 creates precise, data-driven personas that, when coupled with in-store location and data proximity technologies, can tailor custom messages and offers, through digital signage or mobile notifications, to the specific interests and goals of the individual shopper. In essence, the intersection of precise data and in-store communications, through digital signage or mobile devices, creates personalized billboards used throughout a store, displaying targeted ads based on a customer's location within the store and their individual tastes and interests. Traditional in-store advertising that uses generic copy and visuals meant to appeal to the most possible customers simply cannot match the level of engagement provided by this entirely customized, personalized digital approach. Although the technology is just now being rolled out into the marketplace, the underlying statistics reveal customizable digital advertising within a storefront has an undeniable advantage to brands that embrace and integrate it into their in-store marketing. Retail brands that invested in digital signage found an average 28% increase in sales revenues. Creating strategies and campaigns that use in-store, personalized digital ads as their centerpiece to maximize engagement. Looking just a bit down the road, retailers will be able to use online conversations to steer and drive authentic customer engagement offline that is immediate and impactful. While the technologies powering such a revelatory approach to in-store engagement are complex by nature, the process itself is simple and straightforward, involving coordination between a data provider, O360, and an in-store analytics platform to process and refine the message. Retailer provides O360 the customer’s in-store location in (product category) and device ID or consumer information. O360 matches category preferences with consumer segment information. A customer continues to move through store, Retailer provides O360 with updated location detail (product family) and/or product engagement and session information. O360 iteratively refines product preferences correlating consumer segment information and the common threads in shopping behavior across facets such as occasions, attributes, and themes. As the customer selects items off shelves or racks, the Retailer provides basket and session ID to O360. O360 matches similar or complementary products and product categories to items tagged with purchase intent based on data derived from online consumer comments. Retailer & O360: Display targeted messages or offers for additional products based on purchase intent and previous consideration matched to O360 product and persona attributes, occasions and themes. Retailer & O360: Measure the effectiveness of messages and offers in driving conversion and learn how to improve match rates. In simpler terms, a retail store is wired by a provider to supply O360 the customer’s identity from the pixel ID on their phone, as well as their location within the store through Wi-Fi tracking triangulation. 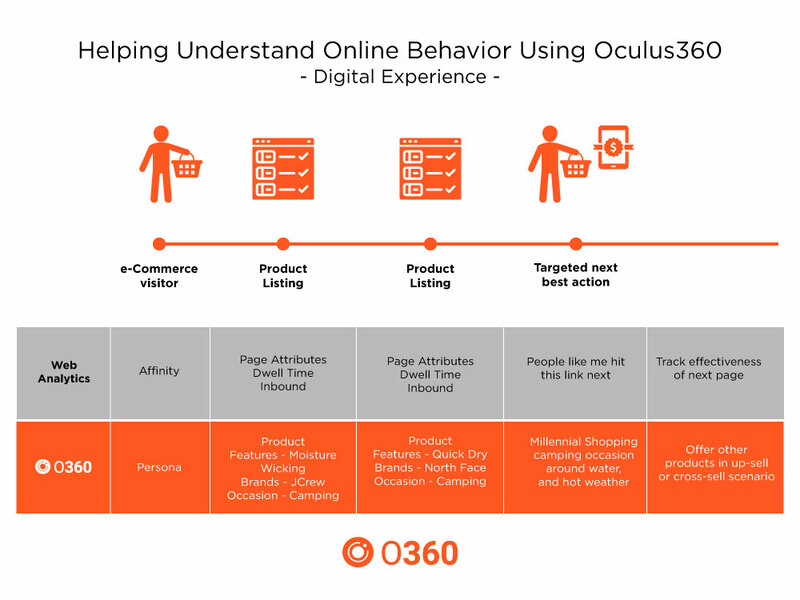 Oculus360 takes that information and matches it with a pre-existing matrix of the specific attributes and occasions relevant to each product and product category. From there, in-store display ads and push notifications to their phone can feature offers and recommendations tailored to the individual, magnifying an offer’s use rate while enhancing upsell and cross-selling opportunities. With so much effort and money invested in the online experience, retail brands must employ similar tactics to their in-store campaigns to find similar results. The combination of O360’s insights, along with detailed in-store analytics, provides retailers with the tools needed to realize those results. In-store campaigns no longer have to take the passive approach meant to appeal to as many customers as possible with one fell swoop. Instead, driven by O360s innovative platform, retailers can tailor their messaging to the individual in real time, lending the unique experience of in-store shopping a digitally driven sense of direction that will maximize sales, loyalty, and success well into the future.